Vaudine England has kindly sent a link to what she describes as a typically 1900-era directory of the European empires in the east. The author was D Warren Smith. Of great interest to us is a rather neat summary of the industries and shipyards at that time. We have already posted Part One – Industries and Part Two – Shipyards, see their links in Related Indhhk articles below. 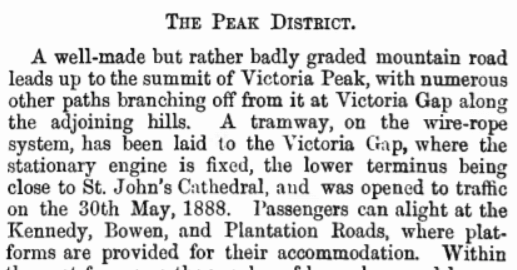 Third up is a short section on what Warren Smith titles The Peak District. This is of less relevance to HK’s industrial history though it does contain a brief description of the Peak Tram. Also development of housing on the Peak, plus hotels and a church which I thought might be of interest to those looking for a description of these buildings within this area of Hong Kong at the turn of the 20th century. To aid reader’s searches I have retyped the relevant pages. Many thanks to SCT for proofreading this. This article was first posted on 13th November 2018.